You might be wondering what the heck this map signifies — enthroned as it is on the website of the National Insitute of Food & Agriculture, the USDA’s primary intersection with the academic community — and also visible in an updated form at ABLC Next when USDA Energy Policy director Harry Baumes took the floor. Er, what are AHB, SUBI, BANR, SBAR, NARA, CENUSA, SPARC, IBSS and NEWBIO? You’d be forgiven if you mistook Ahb Subi Banr-Sbar for a well-placed official in the Iranian government — but, in fact, it’s a 9-project network to facilitate the development of regionally-based industries producing advanced biofuels, industrial chemicals, and other biobased products. Seven of them were established in a $156 million NIFA commitment to AFRI Regional Bioenergy System’s Coordinated Agricultural Projects, plus two grants that NIFA awarded in recent months that have similar goals. 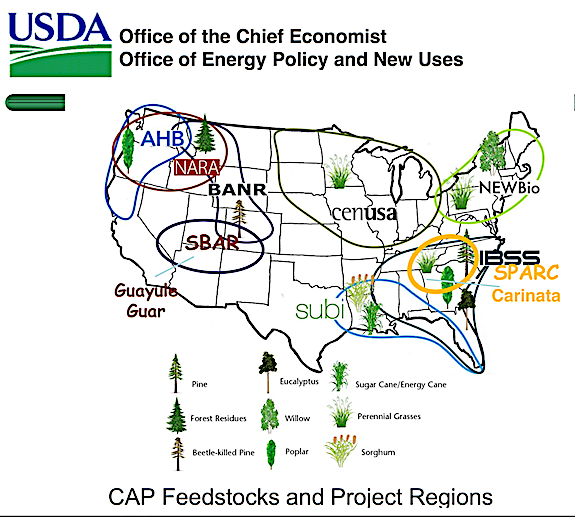 Because it’s a mouthful, they generally call them CAPs, rather than Coordinated Agricultural Projects. They occasionally get decoded as Challenge Area Partnerships, or even Crop Advancement Projects, or Centers for Agricultural Progress. Under any decoding, it’s CAP and they are about pushing yields, growing regions, logistics for harvest and distribution, and especially for emerging crops and varietals. Or, as we like to think of it, as No Crop Left Behind. The really interesting thing, if you look at the USDA’s map, here — is that the only state in the Lower 48 that isn’t in a project area is Oklahoma. Since the EPA has apparently moved to Oklahoma, perhaps this is balancing things out a little in terms of federal spending. Let’s look at the projects and partners. Advanced Hardwood Biofuels Northwest (AHB), led by the University of Washington is working to prepare the Pacific Northwest for a biofuels industry using purpose-grown hardwoods as feedstocks for gasoline and aviation fuels and industrial chemicals. AHB is a consortium of six universities and two industry partners that are working together to establish a sustainable biofuels industry by researching and developing ways to grow and convert hybrid poplars into biobased chemicals and liquid biofuels. AHB is divided into five project topic areas designed to focus on all aspects of successfully producing advanced biofuels and bioproducts from hardwoods in the Pacific Northwest: feedstock development, conversion, sustainability, education, and extension. The CenUSA Bioenergy partnership is led by Iowa State University and is investigating a Midwestern system for producing biofuels and bioproducts using perennial grasses grown on marginal lands. The system improves agricultural sustainability as the perennial grasses reduce nutrient runoff and increase soil carbon sequestration. CenUSA is an eight institution network that promotes region-enhancing ecosystem services growing switchgrass and other perennial grasses on marginal lands and buffers bordering traditional row crop production for the production of advanced transportation fuels and biobased products. CenUSA works with farmers and landowners to study how an economically and environmentally sustainable feedstock supply chain may be developed, providing feedstock to processors while creating important ecosystem services like reduced erosion and nutrient runoff and preserved biodiversity. Since 2012, CenUSA’s system approach has made important contributions to these goals, laying the groundwork for a sustainable, regional system for biofuels and bioproducts. For an overview of their accomplishments see Creating a Sustainable Biofuels and Bioproducts System for the Midwest. NEWBio: Northeast Woody / Warm-season Biomass Consortium led by the Pennsylvania State University is investigating a variety of feedstocks including willow, switchgrass, and miscanthus for advanced biofuels. NEWBio is a regional network of universities, businesses, and governmental organizations dedicated to building robust, scalable, and sustainable value chains for biomass energy in the Northeast. Driven by the broad societal benefits that sustainable bioenergy value chains could provide, NEWBio aims to renew the northeastern landscape by overcoming existing barriers and dramatically increasing the sustainable, cost-effective supply of lignocellulosic biomass while reducing net greenhouse gas emissions, enhancing ecosystem services, and building vibrant communities. By investigating several distinct feedstock production and value chain strategies, NEWBio observes how bioenergy expansion differs across diverse Northeast localities depending on natural and human capital, legacies of interest and expertise, and shared future visions. Led by Washington State University, the Northwest Advanced Renewables Alliance (NARA) is focused on providing a wide range of research and analyses for a developing industry that converts forest residuals into bio-jet fuel and other co-products. NARA is an alliance of public universities, government laboratories and private industry in the Pacific Northwest region that provides technologies, resources and analyses for stakeholders interested in using forest residuals from logging operations as feedstock to create sustainable industry that produces biobased alternatives to petroleum-based products such as aviation biofuels and important co-products. The alliance is taking a comprehensive approach to building a supply chain for aviation biofuel with the goal of increasing the economic, environmental, and social sustainability across the supply chain from forestry operations to conversion processes. Southeast Partnership for Integrated Biomass Supply Systems (IBSS) led by the University of Tennessee is using switchgrass and woody biomass to produce gasoline, butanol, and aviation fuel. IBSS demonstrates real-world solutions towards economically and environmentally sustainable production and conversion of biomass-to-biofuel in the southeast United States. This Partnership is helping to meet the USDA goal of producing almost 50% of the next generation of biofuels in the southeast, while supporting robust and innovative research, education and extension activities. IBSS is developing pathways to successfully produce sustainable biofuels and bioproducts from pine, poplar, eucalyptus, and switchgrass feedstocks. Sustainable Bioproduct Initiative (SUBI): A Regional Program for Production of Multiple Agricultural Feedstocks and Processing to Biofuels and Biobased Chemicals led by Louisiana State University (LSU) AgCenter is using energy cane and sweet sorghum to produce butanol, aviation fuel, and other industrial chemicals. The project involves a team of university and industry partners led by the LSU AgCenter, studying the regular production of biomass for economically viable conversion to biofuels and bioenergy using existing refinery infrastructure. Through new and existing industrial partnerships, this project is using energy cane and sweet sorghum to help reinvigorate the Louisiana sugar and chemical industries. SUBI is helping to expand the southern regional agricultural sector by utilizing sweet sorghum and energy cane to produce butanol, gasoline, isoprene and byproduct chemicals. Ultimately, the project is contributing significantly to improving rural prosperity and job creation in the region. The Bioenergy Alliance Network of the Rockies (BANR) is led by Colorado State University and is investigating use of insect-killed trees as a sustainable feedstock to produce biofuels and biochar. BANR brings together scientists, educators, and extension specialists from universities and government agencies across the mountain-prairie region to work with industry partners to develop a comprehensive program that addresses the major challenges that limit feedstock development, production, logistics and sustainable utilization of insect-killed trees for the production of biofuels and biochar. A robust Advisory Board includes advisors from environmental non-governmental organizations (NGOs), industry, government labs, universities and community leaders. BANR is determining the economic, environmental, and social feasibility of harvesting insect-damaged trees and converting them to advanced liquid transportation fuels and carbon-sequestering biochar soil amendments using a mobile thermochemical (pyrolysis) conversion platform. The Sustainable Bioeconomy for Arid Regions (SBAR) is a multi-level research project that will cultivate two desert-dwelling crops, guayule and guar, for a sustainable bioeconomy. The Energy Independence and Security Act is calling for the production of 36B gallons per year of biofuels by 2022. Combined, guayule (perennial) and guar (annual) feedstocks can provide biomass year round for biofuel production. Both crops are drought and heat tolerant, grow on marginal lands, and provide economic returns. Scale up to profitable production, however, requires feedstock improvements, expansion of cultivation, agronomic knowledge and practices, and economic crop residue utilization. Researchers from The University of Arizona (UA), Bridgestone Americas, Inc., Colorado School of Mines (CSM), Colorado State University (CSU), New Mexico State University (NMSU), and the USDA-ARS will collaborate on research, development, and deployment (RDD) activities to: 1) improve feedstock; 2) produce feedstock in a sustainable manner; 3) understand how conversion to fuel is affected by variable feedstock quality; and 4) enhance transport, techno-economic, and sustainability models to provide a clear path to commercialization. Partners such as Iowa State University, Pacific Northwest Laboratories, and Mercurius Biofuels Inc. be engaged midway through the project to assess and scale-up bagasse conversion and upgrading to jet, biodiesel, and gasoline.SBAR will co-produce biofuels and bioproducts using minimal water and nutrients from guar and guayule crops. Through the Southeast Partnership for Advanced Renewables from Carinata (SPARC), we propose to establish a Brassica carinata (carinata) based resilient and sustainable advanced jet fuel and bioproducts supply chain in the Southeast US (SE US). The objectives are aligned to the program priorities and those outlined in the Federal Alternative Jet Fuels R&D Strategy (NSTC, 2016). 6) Develop a comprehensive Extension, education and outreach program to build producer and supply chain participant knowledge and trust; deliver workforce development through K-12, undergraduate, graduate, and postgraduate bioenergy workforce education and internships (Outreach and Workforce Development Team).